The Ceramic floor tiles shown below were installed in a Luton high street restaurant, as you can see they were far from clean, deeply stained and even the grout had gone black. Given the amount of dirt on the tile and grout we decided to apply a very strong combination of Tile Doctor Remove and Go mixed 50/50 with NanoTech Ultra Clean which results in the creation of a heavy duty stripper/cleaner containing nano sized abrasive particles that can penetrate deep into the dirt. 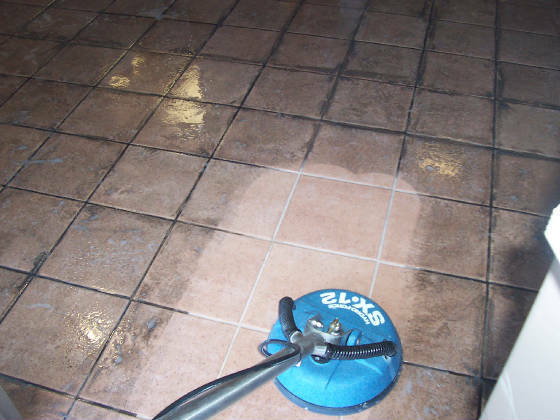 The cleaning solution was left to dwell on the surface of the tile for twenty minutes before using a Rotovac machine which applies and removes water at high pressure to remove the dirt and rinse the floor. 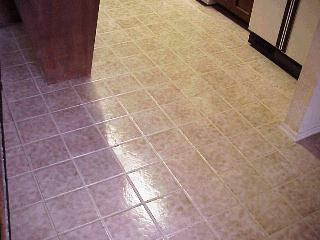 Glazed ceramic tiles won’t take a sealer so once the entire floor was dry and stubborn areas re-done we were finished. This entry was posted in Ceramic Posts and tagged bedfordshire, ceramic tiles, cleaning services, deep cleaning, floor maintenance, luton high street, restaurant, tile cleaning, tile restoration, tiled floor by AbzDominise. Bookmark the permalink.